Can you see a running theme here? I'm bloody loving haircare at the moment, I'm always excited to try out new shampoos and conditioners and styling products. I quite happy with my hair at the moment, so I'm always on the look out for ways to make it looks its best. I actually got a comment the other day with a suggestion to do a 'how I style my hair' post. Don't know if that would be of interest to anyone? It's nothing too crazy or complicated so I don't know if it would be a bit boring ha. But anyway, onto my review. I had used Bumble and Bumble previously, I first saw it in a salon I went to when I was living in Chicago. They have quite an extensive range so I was really excited to try some I hadn't used before. This time I tried the 'mending' range - as I thought my highlighted hair could do with some care and attention. The 'mending' range is meant to 'repair, strengthen, shine and protect' and I must say I think it does a pretty good job. I'm really big on how well shampoos lather, as you will know if you have read any of my other haircare reviews, and the BB Mending Shampoo is really great for it. I think it really helps to make it feel like your hair is really getting clean - which is what you want from a shampoo. 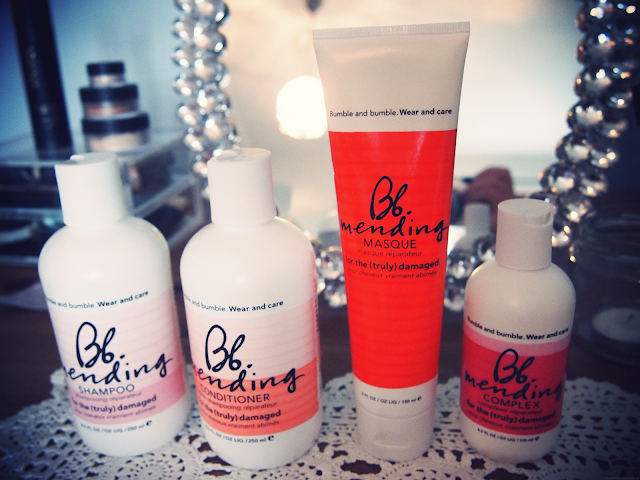 The BB Mending Conditioner is lovely and nourishing with a really nice fragrance and the BB Mending Masque is lovely for a weekly, more intense, treatment. What I was intrigued about the most was the BB Mending Complex. As I've said in other posts I love hair oil at the moment so it was nice to try something else for a change. You use the BB Mending Complex on damp hair and then style as normal. It is a cream consistency, similar to a conditioner, and I really think it helps to keep your hair smooth and soft - very nice. So yet again, another lovely haircare range! This is becoming quite an obsession. Also - how cute is the packaging (you know I love my packaging).